Because of the USB port on the PS3 controller, I always considered the DualShock charging stations I saw at Best Buy to be like bottled water. Why pay for something that's already provided for free, right? Just plug the damn thing in when it runs low on juice. Thing is, I like it when my water's really cold, and doesn't smell like leftovers. I'll drink cold, straight-from-the-fridge water over many soft drinks. I'm not buying the commodity, I'm buying the convenience of having it there in the state I want it when I'm ready to consume it. That's why, at $25, I think Nyko's Charge Base 3 for PlayStation 3 is a reasonable luxury for those who are sick of connecting USB cables to their PS3 controllers whenever company comes over. What drives the Charge Base 3's convenience is a magnetic dongle that attaches to a PS3 controller (standard or DualShock). You fit this bracket over the front of the controller, plugging it into the USB slot. It has a magnetic attachment that secures it to the charging base, so when you're ready to power up, it's a simple one-handed motion to fit it in place. You're not grasping the charge base with one hand and driving the controller into it with the other, making sure to line up the USB slots. It's like hanging up a phone, assuming anyone uses a land line anymore. It gives you a full glass of cold juice, straight from the fridge. You don't need to remove the dongle bracket when you play. It does, in its only drawback, obscure three of the four LEDs which designate which number controller you're using (or which flash in unison when there's no power or something's gone wrong). You can always just pull off the dongle to be sure if you've got a problem. Prying it loose can be a pain when you hit the PlayStation button and either bring up its menu or power on the console inadvertently. In most cases, especially when you're playing alone, you won't need to do this. The dongle becomes almost a permanent accessory to your controller. Snapping it into the charger when you're done can be done one handed. Just get it in the neighborhood of the magnet and let go. LEDs on the two ports glow red and then green to tell you when each controller is all juiced up. It took about an hour to fully charge a partially depleted controller and two to fill up one that had been completely drained. If they sit at green long enough, their LEDs will go dark. The charging station itself has an on-off switch, so you can leave fully charged controllers plugged into it and powered off, without depleting their battery cycles or wasting power. Yes, I've gamed for three years on the PlayStation 3 using traditional USB cables to charge my controllers or, in emergency, to power them while I played. 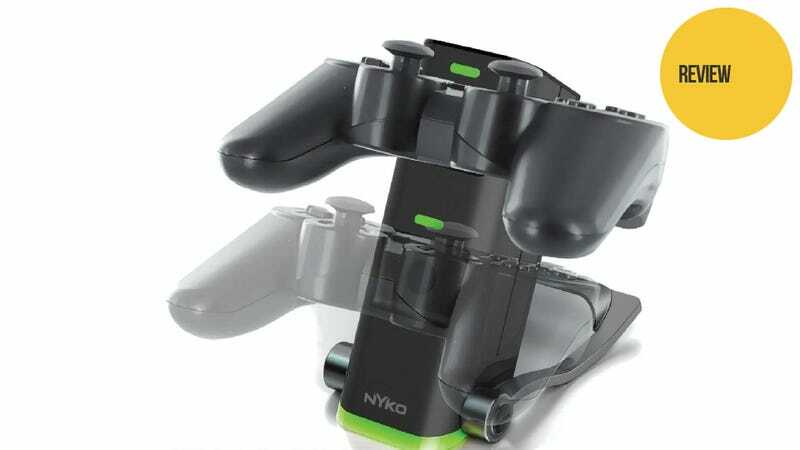 The Nyko Charge Base 3 is a worthwhile luxury because of its dedicated power supply, its convenient, cantilevered arrangement for hanging up two controllers, and because it gives you a full glass of cold juice, straight from the fridge.